I thought the Product was just as it was advertised as. I was very happy from start to end. Would strongly recommend bed bench and Overstock to everyone. Easy to order and quick to receive. Vintage can refer to classic, add in a relaxed style and you create a classic look with a casual feel. Looks that easily work in today's homes. Style uncompromised with comfort abound. Farmhouse reimagined offers cottage styles you love in a heavily distressed finish that will work from the beach to the mountains to an industrial loft. Dimensions 18.0 In. X 52.0 In. X 19.0 In. This is the MOST BEAUTIFUL BENCH EVER! I'm using it at the foot of my bed. The legs are gorgeous and elegant shabby chic or farmhouse style for sure. I love the wood on top of it as well. You can use this bench with the top on or off. Very nice bench. Matched my furniture perfect. Very, very sturdy piece, excellent quality. Aesthetically, not sure if it was what I was going for, but I am still in the process of purchasing other pieces of the set, so hoping it will all come together when it's said and done. Assembly only required attaching the legs and the bottom shelf, very easy and took me maybe 15 mins to do it. 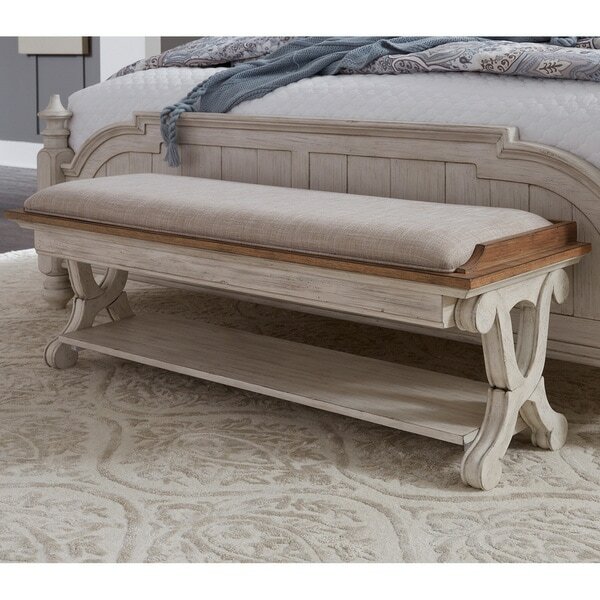 I ordered this bench seat, it looks exactly like the picture, easy to assemble. Matches my bedroom suit. I usually don’t like ordering on line & return item because I don’t like it, but this one a keeper. Bench color was perfect (as pictured)! Very nice and sturdy, great quality. The bench will be used for our large dogs to get on and off of our tall bed. It was easy to put together, would purchase again! High quality. Weight was ~75 pounds. Goes well with the bed. Shipped direct from Overstock in 2 days. Easy assembly. Great bench. Goes perfect in our bedroom with the other Farmhouse Reimagined nightstand and dresser! It arrived very quickly and in great condition! I absolutely love this bench! Feels so sturdy and heavy and was very easy to put together! So happy with this purchase! I absolutely love the quality of this piece. It is well made and actually made of real wood. It was extremely easy to put together. I would highly recommend this piece to anyone looking for a well made piece at a reasonable price. Ordered this piece for the front entry instead and it fits perfectly. Beautiful piece of furniture. Came early and easy to put together. The bench is durable. Very sturdy well built bench with excellent material for seating. Using in living room for extra seating. Many compliments already and have only had it a few weeks. Yes, it is removable. Actually looks good with it on or off. Nice wood bench seat if it is off. I am redecorating my bedroom and will be purchasing this full set. I purchased just the nightstand as I needed one for my bedroom. I loved the look and ended up really liking the nightstand so I purchased the complete bedroom set. Each piece has been well made and looks like pictured! I have not regretted getting this set!